Nothing is more satisfying to a gardener than those first flowers in the spring. After a long winter (and even after an almost non-existent one like we had this year), we’re always out in the garden, looking for those early bloomers. Hellebores seem to have been made for us Northern gardeners. You don’t get much earlier than a perennial that sometimes blooms through the snow. A friend who lives in Toronto contacted me a while back to let me know that one of the hellebores she’d bought from me last year kept sending up new blooms all winter because of the lack of snow. How cool is that? 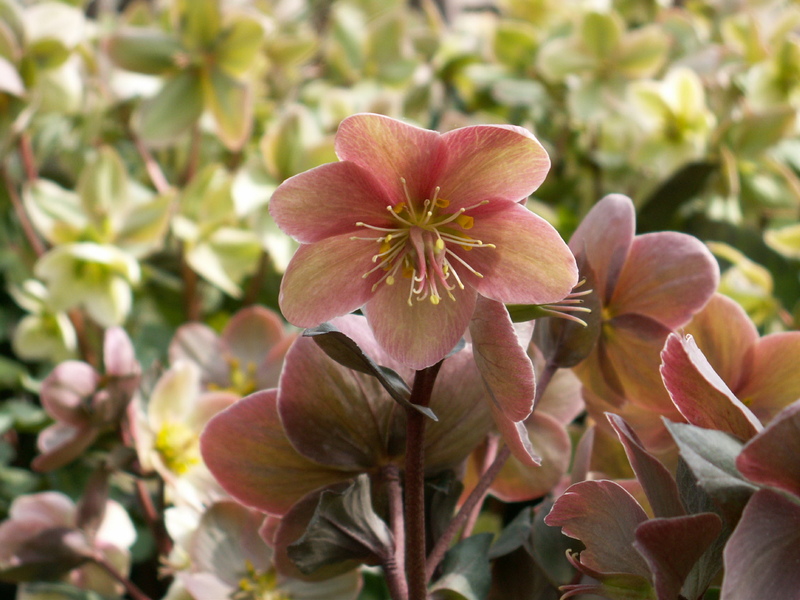 Back in 2005, hellebores were perennial of the year, and with good reason. They bloom very early and unlike most other early spring bloomers, the blooms last for quite a while. They grow in shade. Their foliage is evergreen, although I personally tend to cut off last year’s leaves as part of my early spring chores. The flowers come out before the new leaves and I find I get a better show. When the leaves come out, they stay nice all season. They don’t seem to have any pest problems, including those dreaded deer that love to dine on your Hostas. I also haven’t seen any disease problems, even though blackspot can be a problem in England. Another bonus is that they provide early pollen for the bees, when there is less available, but the need is quite high. The trouble at the time that they were perennial of the year was that there wasn’t a lot of choice available. Most of the plants available were seed grown, which meant flowers were variable, and you had to buy them in bloom to get the colour that you wanted. Since then there has been an explosion of different varieties available. On Sunday, I completed the prep work for a renewed shade garden. Among other plants, there will be a hellebore collection. I’ve set aside twenty varieties and made a list of ten others that I would like to include. Typically, hellebores have nodding flowers in various shades of pink, yellow, white, green and purple (tags never say purple; they say black or blue) and come in singles and doubles. The singles often have wonderful markings and spots on the inside of the flowers and the doubles sometimes have picotee edges. A few years ago, one variety seemed to stand out from the rest. ‘Ivory Prince’ boasts ivory white flowers, with a hint of blush and green streaks in the flowers. It’s been a very strong grower and has proven to be very winter hardy. Best of all, the flowers face up and outwards, so you don’t have to bend over to see them. The next thing I noticed was that the flowers tended to dry on the plant and stick around, much like a Hydrangea. I’ve seen the occasional flower still on the plant when preparing for the winter. Following in the footsteps of ‘Ivory Prince’ came ‘Pink Frost’. It was very similar in size, form and vigor, but with a much more pronounced pink colour. Then, as the flowers aged, they turned this wonderful antique rose colour and stayed on the plants for months. Again, some were still there at the end of the season. This one quickly became my favourite and looks amazing when planted in groups alongside ‘Ivory Prince’. It’s easy to see why many people, myself included, begin to obsess about collecting these wonderful shade plants and I’m so excited to see what new ones there are this year. Some of them I’ve already seen, like ‘Moonlit Marble’ which seems to be a lot like Pink Frost, but with marbled leaves, while others I’ll have to be patient and wait for them. ‘Grape Galaxy’, at least from its pictures, has flowers that remind me of dark purple Rhododendrons. I know that some of you are laughing right now, at least those that know me. I’ll admit, I do get excited about plants pretty easily and have a few (can you tell I’m blushing) collections on the go already.